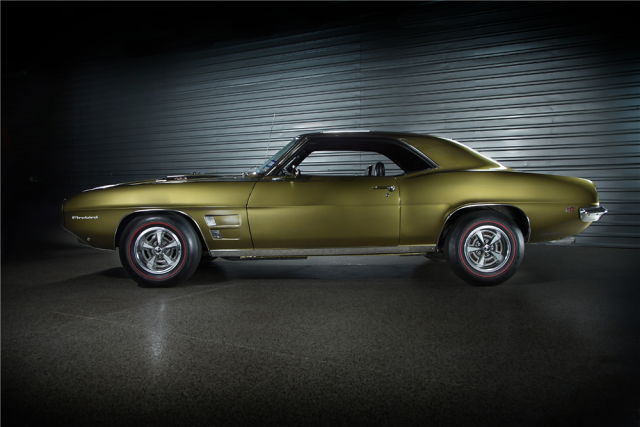 The very first 1969 Pontiac Firebird goes up for bids at Barrett-Jackson’s Las Vegas auction later this month. This restored beauty features a fresh Verdoro Green paint job and comes with the original engine and transmission. VIN #001 is sure to catch the attention of several collectors at this year’s auction. Here’s what makes this car even more interesting. It was created as an auto show car and was supposed to be returned to Pontiac. Somehow, that never happened and it winded up being retained by the dealer. It comes heavily optioned with features such as air conditioning, tilt wheel, and deluxe interior. This VIN #001 also joins the first and second 1967 Pontiac Firebirds ever created. No doubt, this auction will definitely be on the radar of many Pontiac fans. For more information on the upcoming auction, head over to barrett-jackson.com. 10/25/2016 Update: The 1969 Firebird scored a winning bid of $165,000. Unfortunately, the Reserve was not met, with bids topping out and falling wayyyyy short at only $300K!!! That must be a real bummer for the current owners who paid $645K for them in 2014. Wow! I would want to bury my head in the sand when they fell short of what they originally paid for the duo by a huge tune of $345K!!! Well, looking at the good, I guess, they got a spot on TV. Woohoo! The buyer/current owner, was a real stickler in giving 60 days to restore the cars or else, they were gonna impose a $10K a day penalty to the business who restored the pair. I guess being tough and putting the pressure on the people who restored them ended up being their medicine, in a way, of $345K. God, I would have a heart attack knowing I paid over double what they are worth. So, they are numbers 1 and 2 to roll off the assembly line. That’s neat and all, but not worth those ridiculous bucks. Plus, why would anyone want to rush a restoration of two supposed “holy grail” cars to be done in 60 days? BTW, point made on the rushy restoration: The left rear brake light was not working on the red? firebird, I think it was while is was rolling off unsold from the auction block! Hahaha. I mean, come on. Seriously. You are asking over half a mil for a pair of cars that aren’t 100% functional. A bulb? Maybe, but the point is, if you expect people to pony up some serious coin, you better have a flawless presentation. Perhaps too much publicity on those cars in the media, with the condition they were in before restorations. You know? TMI. The rest of the auction fetched some amazing prices. So the auction house were on, with all the other cars. The business who restored them came through under those super tight terms. Nobody could do their best work, 110% in such a short amount of time to turn them. No fault of restorers or auction house. Just the current owners were off a long bit on the value. Well, keep them for 20 years and all the insurance, registration and operating/maintenance costs may offset a break even. Too funny.